There is so much brightness and a variety of hues on the doors of County Cork. Having been in love with color from an early age, I am loving the rich colors surrounding my new home. I couldn’t resist taking photos of all the doors that captured my attention. I’ll admit that on our walk up to Charles Fort in Kinsale, it took a very long time because I kept stopping to take photos. There is one particular block in downtown Cork City Centre in which each door is a different color. It is picturesque. I had heard this was so men coming home late (and a wee bit inebriated) could find their home by the color of the door. Is that the real history? Who knows, but they are beautiful. The printing quality is lovely and crisp (I’ve seen a poster in person). There are many other items in the shop. Lovely uniquely-designed independent artist gifts that still fit in your budget. 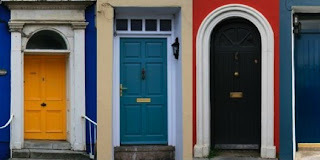 This entry was posted in Cork City, Ireland, Photography and tagged irish doors, Travel | Cork.